Borchert Field: Get Yer Tickets Here! 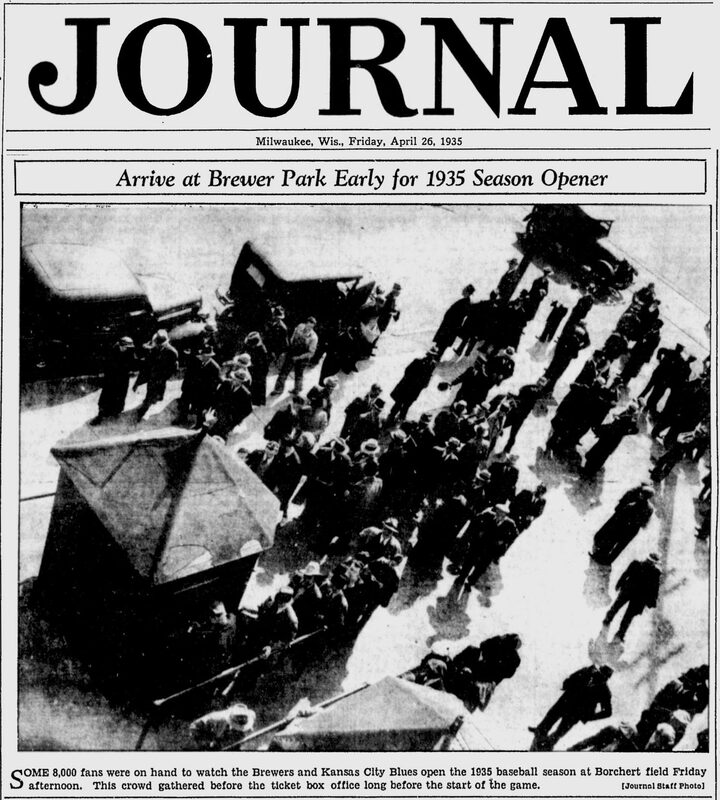 Some 8,000 fans were on hand to watch the Brewers and Kansas City Blues open the 1935 baseball season at Borchert field Friday afternoon. 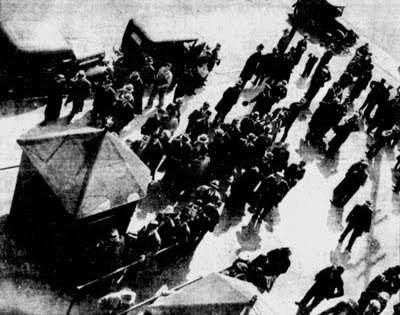 This crowd gathered before the ticket box office long before the start of the game. This is an unusual look at the ballpark. This picture appears to be looking southwest towards the corner of 8th Street and Chambers, looking down from the ballpark's roof. 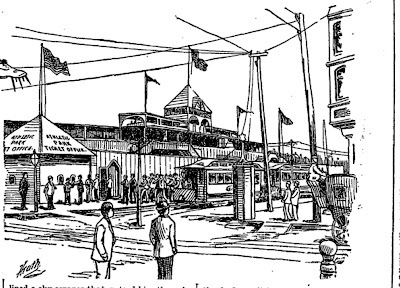 That's 8th and Chambers again, this time kitty-corner, looking northeast back towards the park (the streetcar is on Chambers, and home plate is behind the large tower). The line art seems to be accurate - there's our kiosk, proudly selling tickets to the Brewers. That Milwaukee Brewers club was the Cream City's short-lived entry in the Western League. This colorized postcard of a Sumner W. Matteson photograph shows how the 8th & Chambers ticket kiosk looked in 1909. 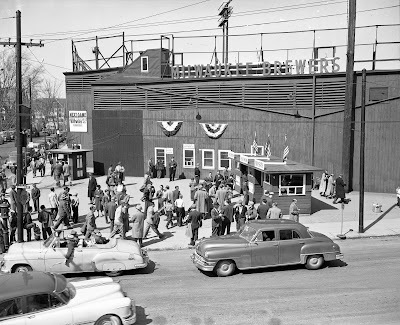 By this point, the ballpark itself is considerably less ornate, having lost its towers. The Journal picture was likely taken from the roof, right around the letters. 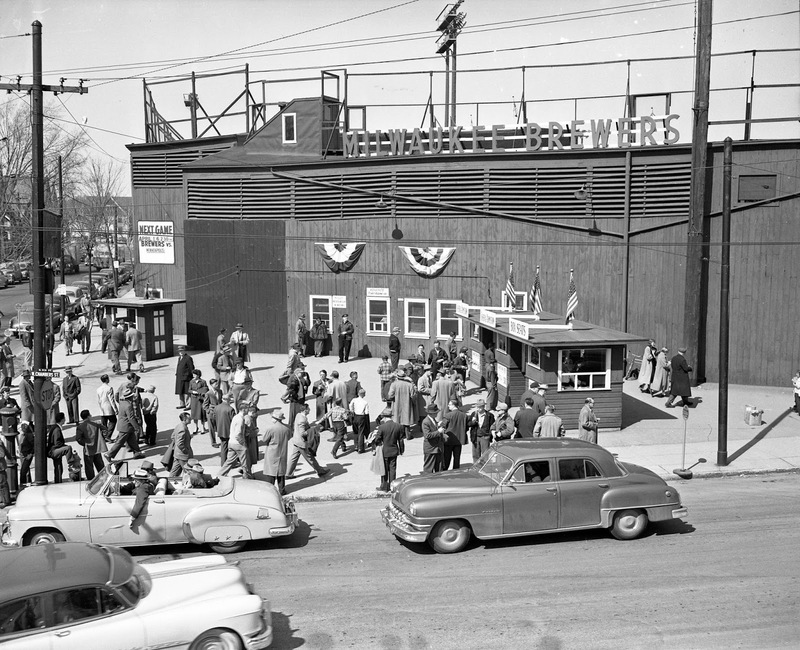 For seventy years, there was one place to go for the best tickets in town. I'm somewhat suspicious of that line drawing. It's a great drawing, but is there anything positively indicating this is Athletic Park? 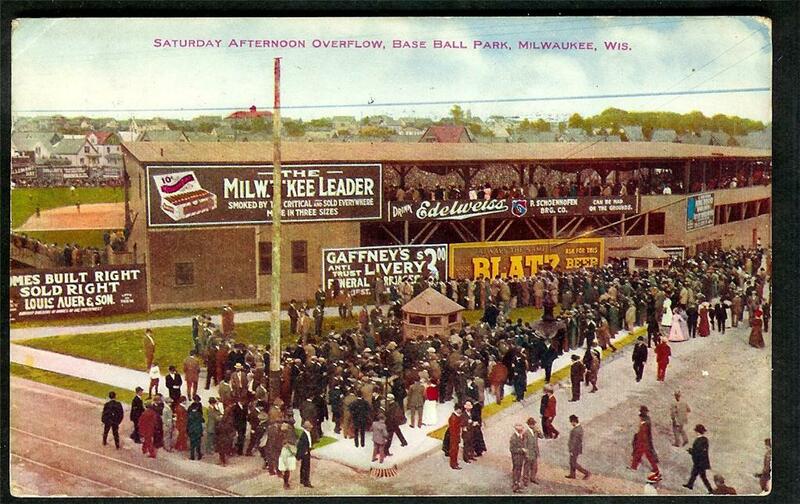 Looks more like what Lloyd Street Grounds looked like, where the 1901 AL Milwaukee Brewers played for one season. Thanks to Dennis Pajot for helping confirm that this is, in fact, Athletic Park at 8th and Chambers. In light of the fact that Lloyd Street Park wasn't built until 1895, the publication date on the image above is the best tip-off, but also the lettering upon the roof of the ticket kiosk indicates this is Athletic Park. Question: How did it come to pass that the cupola and other architectural features of the early Athletic Park were removed? Was storm damage involved? 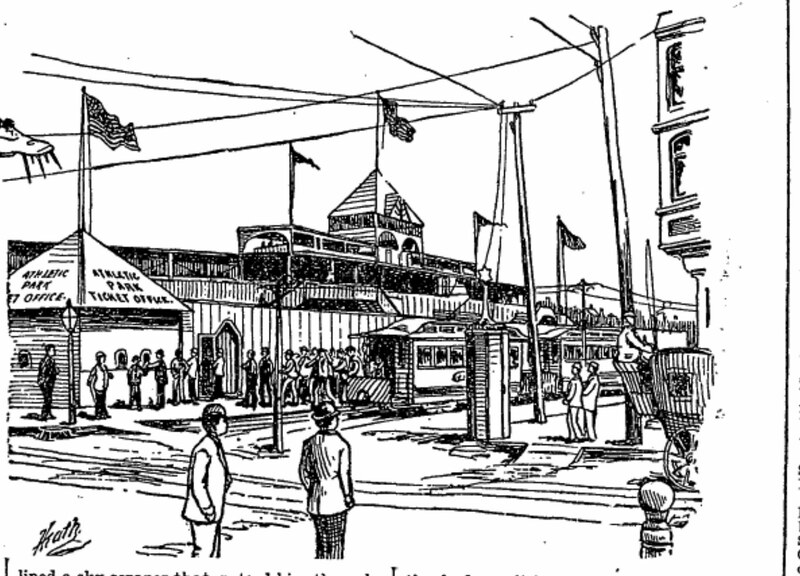 Also, it is very possible that in the 1892 there were two ticket kiosks at this corner, but in the drawing there is a street car obstructing it. There are two visible in the 1909 view, and this is substantiated by the 1910 Sanborn Fire Insurance Map which shows two at this corner, one kiosk at the opposite corner at 7th and Chambers. I'm posting a variation on the question of how the "tower" or cupola on top of the park was lost, but rephrasing it to ask simply WHEN it came off. I wonder if you know the latest drawing or photo showing the tower. We know it was not there in the colorized photo in that incredible Sumner Matteson post card from 1909, so obviously it came off sometime before then. Would be great to get some people involved in this research project, perhaps on behalf of the Ken Keltner SABR chapter. Let me know what you think of this idea by writing to me at pureout@msn.com. Please visit my website at www.almanacfield.com and learn more about the other American Association baseball parks and teams.